You can make jokes with the man, but shouldn’t joke with his name. Marina Tsvetaeva. The name Constantan (constans) translates from Latin as «constant», «constant», since it invariably resistivity with temperature changes. This silvery-gold alloy that contains 32 to 40% Ni, 60% Cu and up to 2% Mn. t° melting point 1260 °C. the Specific weight of 8.9 g/cm3, TCR = 14 • 10-6/°C. At 20 °C electrical resistance = 0.48 Ohm·mm2/m. After stabilizing annealing temperature coefficient of linear expansion is 2x10-61/K, annealed-alloy — SP = 400 — 500 MPa, EP = 40 — 50%, r = 0.46 — 0.48 Ohm·mm2/m; solid — SP = 655 — 720 MPa, EP = 2…5%, r = 0,46 — 0,52 Ohm·mm2/m. Significant deficiency — a significant thermal EMF (40−50 µv/°C) in a pair with copper, which limits its use in stable resistors and high-precision devices, since the heating of the contact terminals leads to the appearance of currents that distort the evidence. Therefore, if the high precision, used Constantan, and manganin. 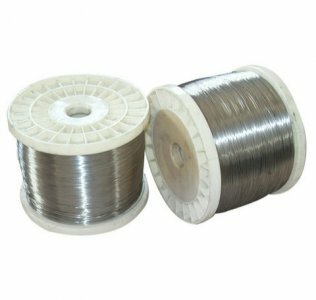 Wide application Constantan found in the manufacture of countervailing wires, rheostats, heating devices. From it produce wire Ø 0,03−5 mm tape and 0.1 mm thickness. Significant thermal EMF of Constantan in contact with copper led to its application in thermocouples for the measurement of relatively low t° to 500 °C. this is typically done using thermocouples, where a positive thermoelectrode is iron, copper and chromel, negative — Constantan, alumel and Copel. The Constantan demanded by the pyrometer, so the main form of rolled wire. Its price depends on world prices for copper and Nickel are the main components of Constantan. Tape (thickness 0.1−5.0 mm width: 3−600mm).